No-bake treats are the best thing for summer. They’re quick and easy so kids can make them on their own and they don’t heat up the house on warm days. 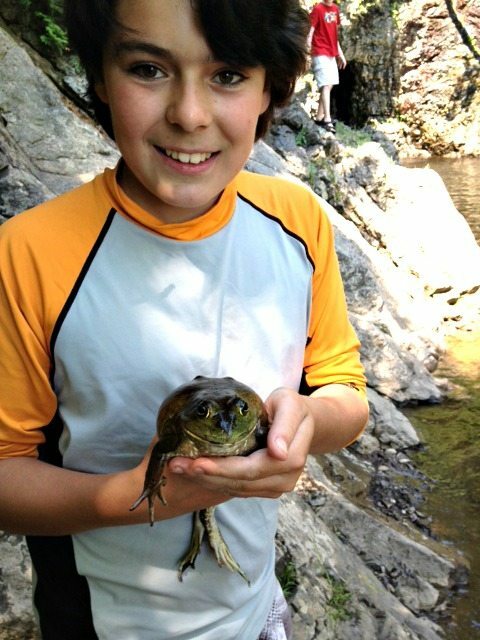 Summers seemed to be filled with frogs and toads when I was little. We’d find toads in the yard and as we traipsed through the woods, and we’d catch frogs and pollywogs down by the brook. 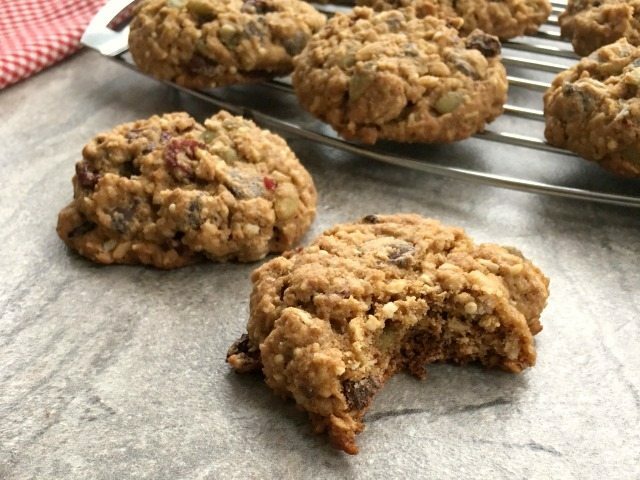 Summer was filled with other kinds of frogs too – chocolate oatmeal frog cookies. My mom had a few different recipes for no–bake cereal squares and other treats. 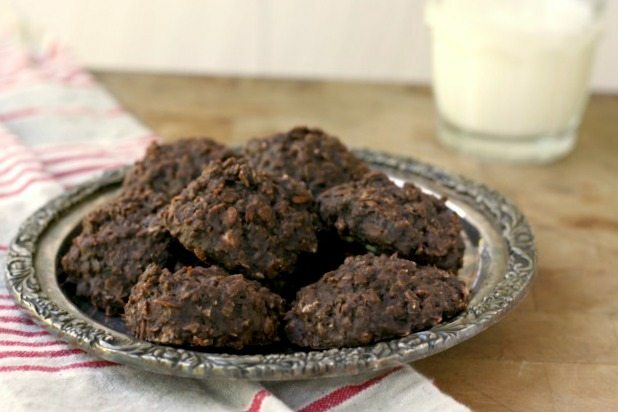 A recipe I recently rediscovered is for no-bake cookies that we called “frogs”. 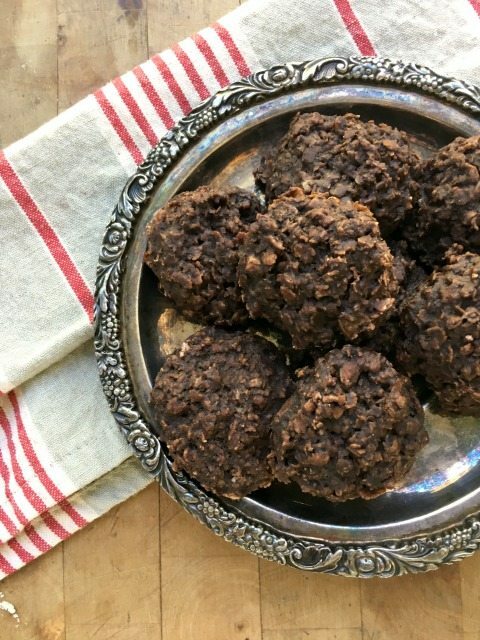 Made with cocoa, rolled oats, milk, butter and not much else, they’re the quickest way I know to make a cookie when you’re craving something sweet. 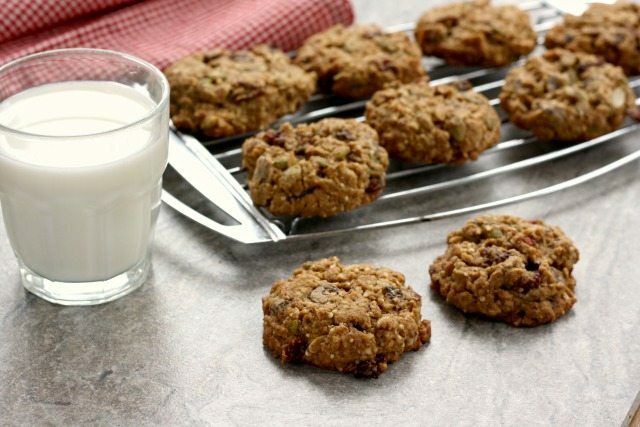 Chocolate oatmeal frog cookies take less than 10 minutes to make and they’re extra easy so kids can make them on their own. 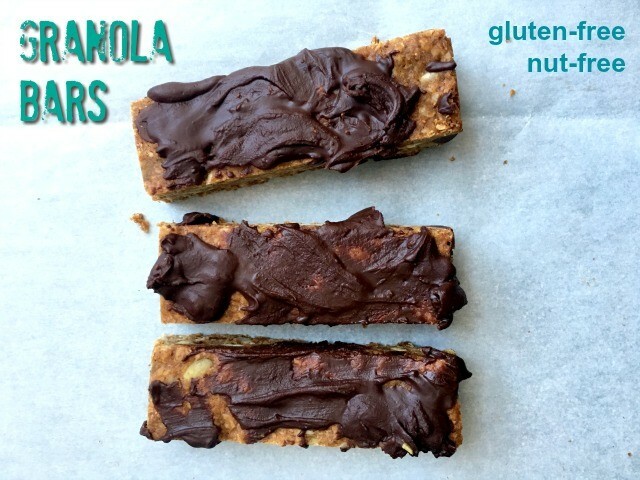 And the bonus is that they’re gluten free, so if you have friends who avoid wheat this is an easy treat to share. 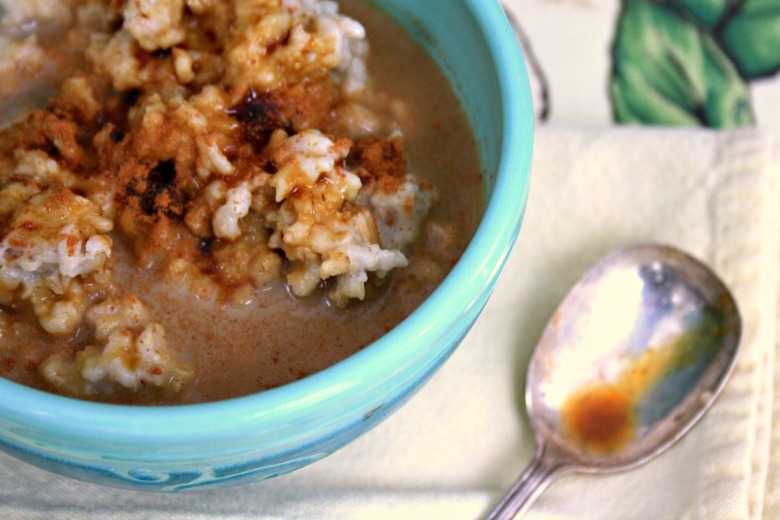 In a large bowl combine cocoa powder, rolled oats and ground flax. Line a large baking sheet with waxed paper or parchment. In a medium pot, combine the sugar, milk, molasses and butter. Bring to a boil over medium heat and cook for two and a half minutes, stirring constantly. Remove from heat, stir in the vanilla and pour over the rolled oats mixture. Stir to combine and quick drop by the spoonful (or a medium cookie scoop) onto prepared pan. Let cool then store in a covered container, between layers of waxed paper or parchment. This recipe is easy enough for kids to make on their own. 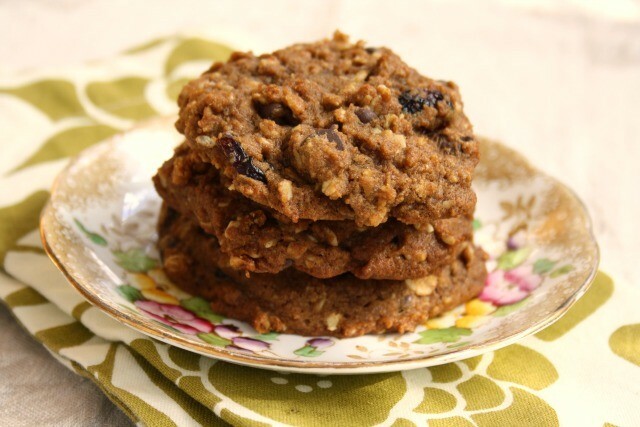 Thick and chewy oatmeal raisin cookies are wholesome and satisfying. When I was growing up we didn’t often get to bakeries. There was really no need since my mom baked all the time at home. When I headed off to university, home baking was hard to come by. There were often care parcels from home and to fill the gaps in between deliveries I searched out local bakeries that baked cookies that tasted homemade. And I didn’t just go for any sort of cookie. Because I was buying food on my own dime I became a bit of an expert in cookie value. 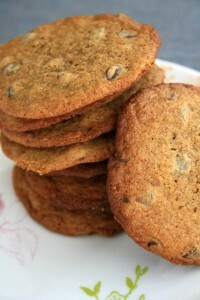 Chocolate chip cookies tended to be thin and not very filling but oatmeal raisin cookies, when made well, were thick, wholesome and satisfying. 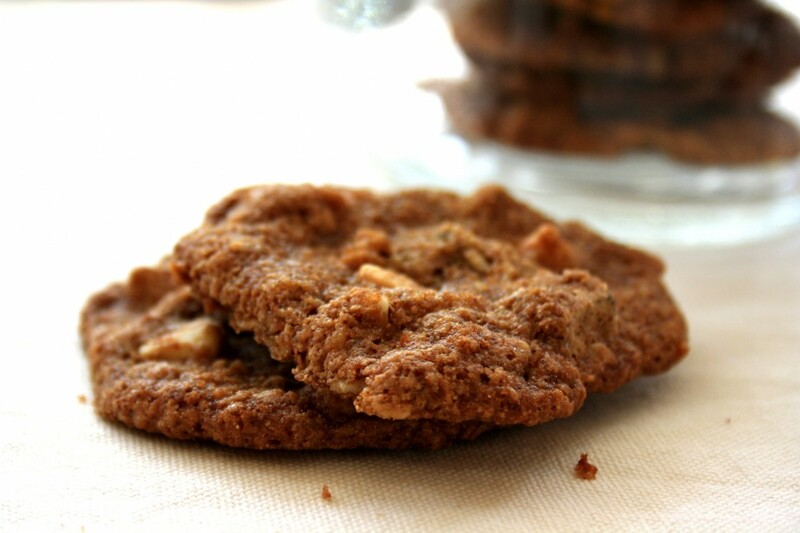 They we larger than the other cookies and would tide you over for the afternoon. That’s how my fondness for this sort of cookie grew — out of sheer practicality. 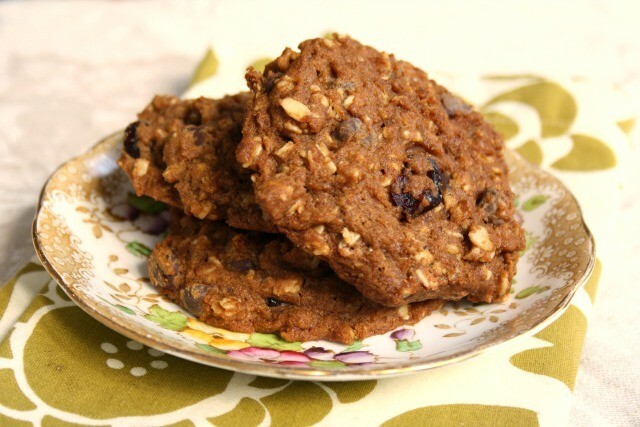 From there the humble oatmeal raisin cookie became a staple on camping trips. 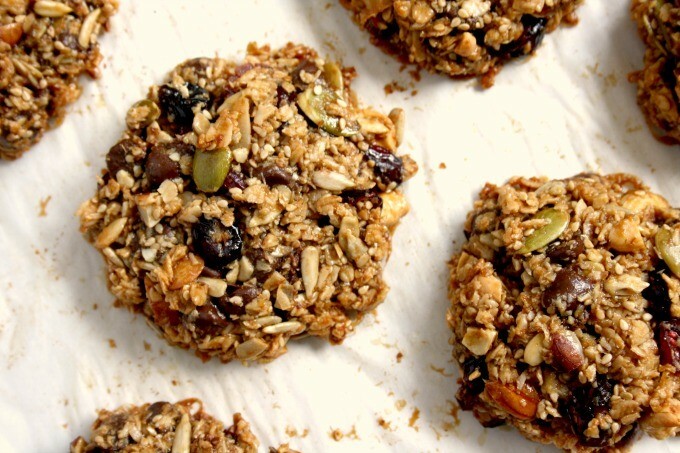 During a day of hiking or mountain biking, thick and chewy oatmeal raisin cookies provided energy and substance and if they got squashed in your backpack you could always press them into a ball without losing a crumb. 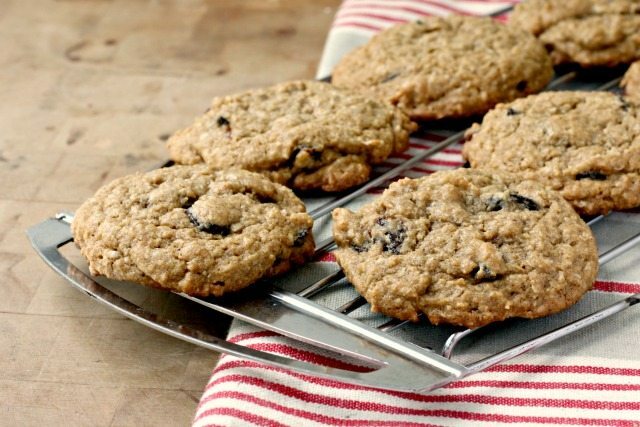 I have several oatmeal raisin cookie recipes that yield thin cookies, but it took a bit to come up with a recipe for the thick and chewy oatmeal raisin cookies I remembered from my university days. 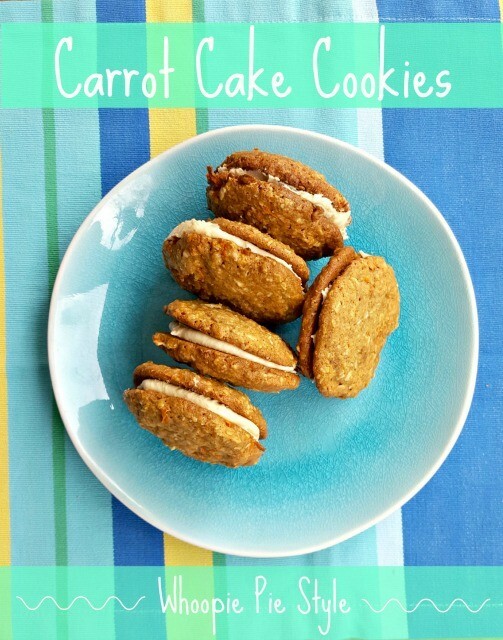 This recipe is slightly adapted from the blog Sally’s Baking Addiction. Chilling the dough is key to keeping the cookies thick while baking. 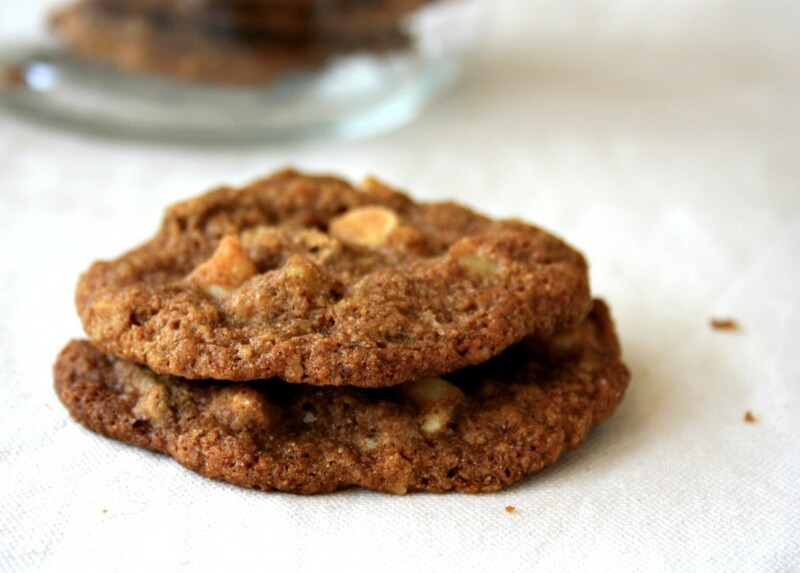 This recipe doubles well and the cookies freeze well. In a large bowl cream the butter and sugar until fluffy and light in colour. Beat in the egg then the vanilla and molasses. In another bowl combine the flour, baking soda, cinnamon and salt. Stir into the creamed mixture. Add rolled oats and raisins and stir until well combined. Preheat oven to 350 F and line a large baking sheet with parchment paper. Drop dough by heaping tablespoonful (or use a medium cookie scoop) onto prepared sheet, about two inches apart. Bake for 11-12 minutes, until edges are set but the middle still looks a little soft. Let cool on the pan for a bit before removing to a rack to cool. 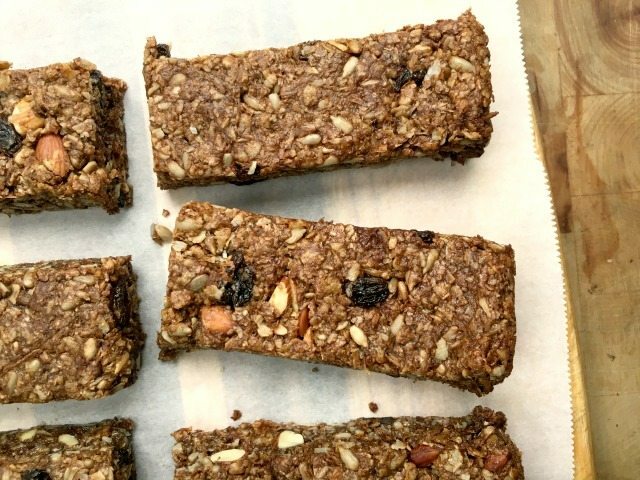 Three-Seed Gluten Free Granola Bars are a wholesome treat for snack time. 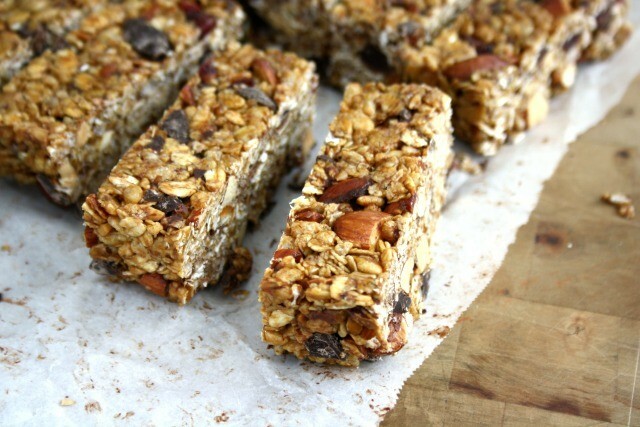 My kids are obsessed with packaged granola bars. There is no shortage of baked goods in our house and our cupboards, fridge and freezer are overflowing with lunchbox options. But still my kids say that there’s nothing in the house to eat. It’s enough to drive me crazy. They’d walk out of the house with nothing but an apple for lunch if it wasn’t for my husband’s insistence on a compromise. We have found our middle ground but the one packaged food that irks me most is packaged granola bars. 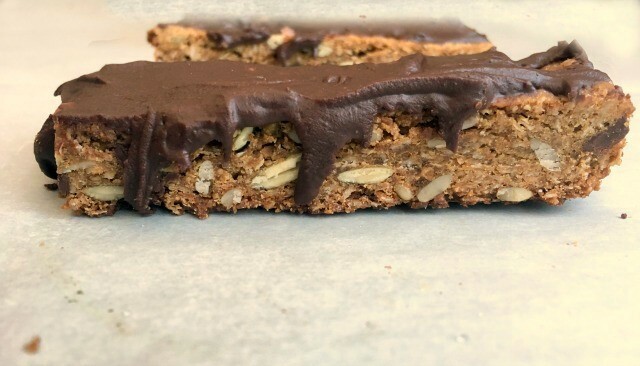 May be it’s that fact that granola bars are just about the simplest things to make at home and that you can stuff all sorts of healthy and delicious things into a batch. Then there’s the extra packaging that comes with individually wrapped packaged bars. Whatever their reasons my kids prefer packaged granola bars, which is why it surprised me when they devoured this batch. And it was my daughter, the pickiest of the two, who kept going back for more. 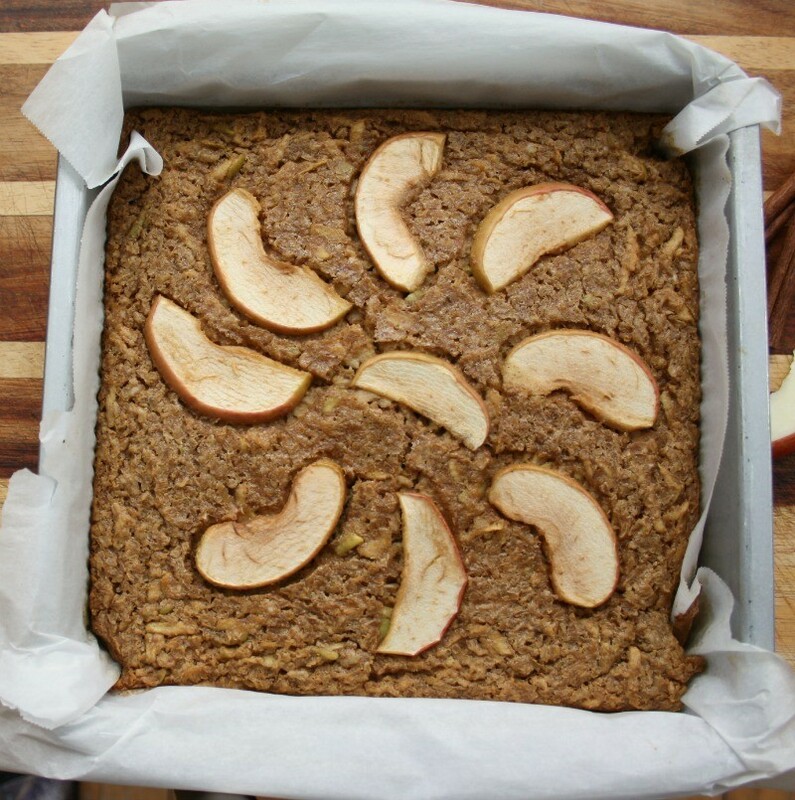 I suspect they were drawn to this recipe because they’re not as oaty as most that I make, and they’re baked so the texture is a little different than the stovetop variety that’s pressed into a pan. The chocolate coating is optional, depending on how picky your crowd is. (Just melt chocolate chips and spread it on the cooled bars). 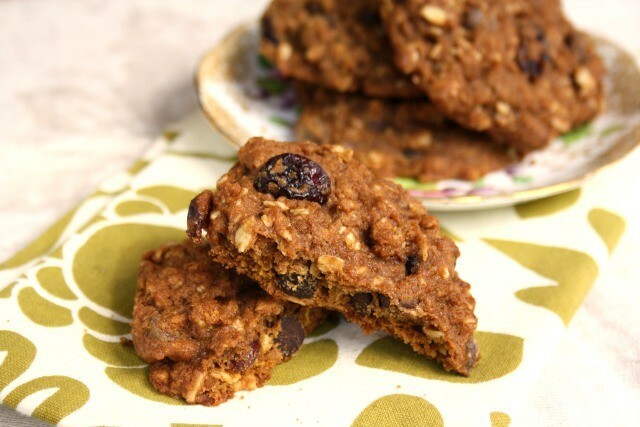 Dried cranberries or apricots are another nice addition to this recipe. 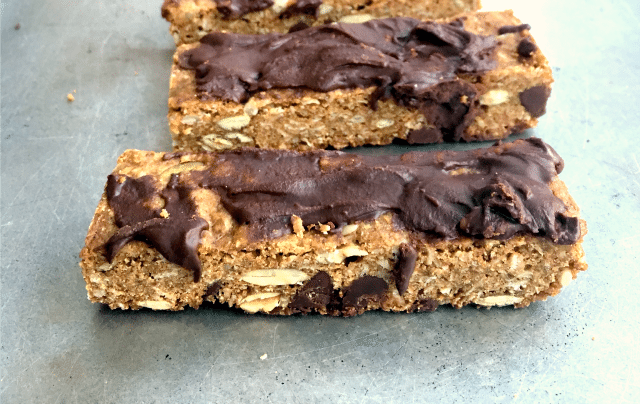 The extra bonus with these gluten free granola bars is that they’re nut-free too so are school-friendly. A special thank you to my friend Linda the Cheese Lady for the recipe. In a large bowl combine all dry ingredients. In a medium bowl combine the wet ingredients. Add the wet ingredients to the dry and stir well. The fields near our cottage are teeming with pumpkins and they’re piled high at Fullerton’s Corner Market, the country store that’s just down the road from our summer place. All these pumpkins were easy to ignore even a week ago, when there was still summer heat in the sun, but once the temperature started dipping into the frost zone I realised that pumpkin season has truly arrived. I’m still not ready to put a pumpkin on my front step but I have started baking with pumpkin. The house has smelled of pumpkin pice spice these past few evenings, a welcome scent when darkness arrives early and the nights are too cool to leave windows open a crack. I have had this recipe tucked aside for ages now waiting for fall. 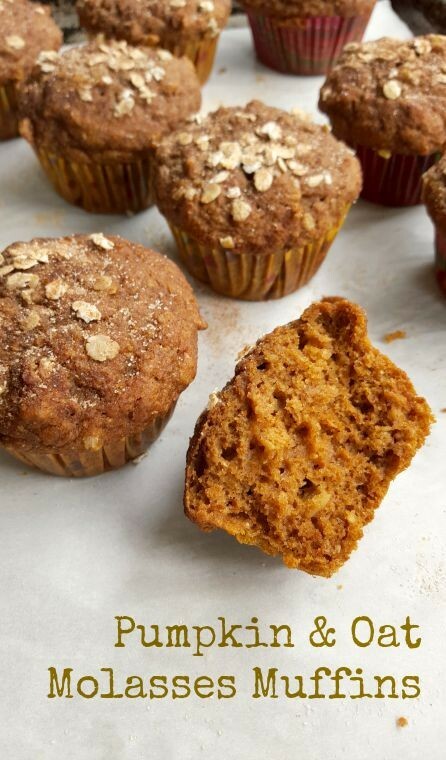 I have a couple of other pumpkin muffin recipes on the blog but this version, with old fashioned oats, is especially appealing. 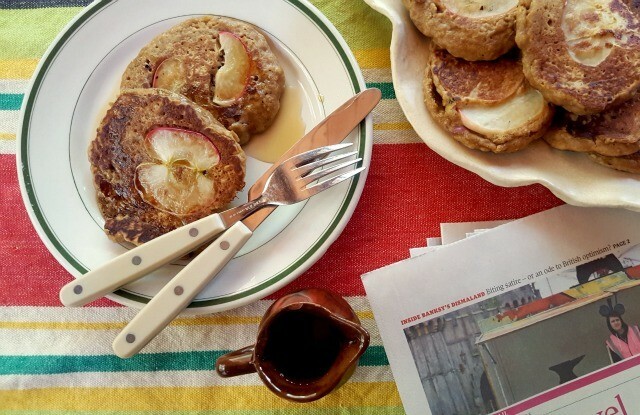 I also love that there is no refined sugar in this recipe, just molasses and your choice of honey or maple syrup. 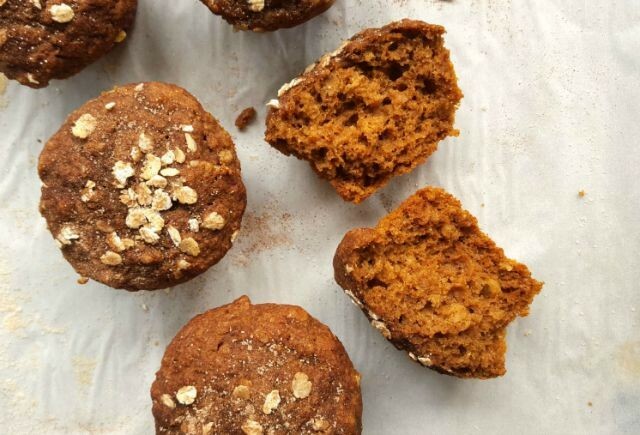 These Pumpkin Oat Molasses Muffins have a surprisingly light texture and they’re nice and moist. I use whole wheat pastry flour, but regular whole wheat flour works fine too. These are great snack muffins. Hearty and wholesome, they hit the spot. No butter required. In a large bowl stir together the flour, oats, baking soda, salt and spices. 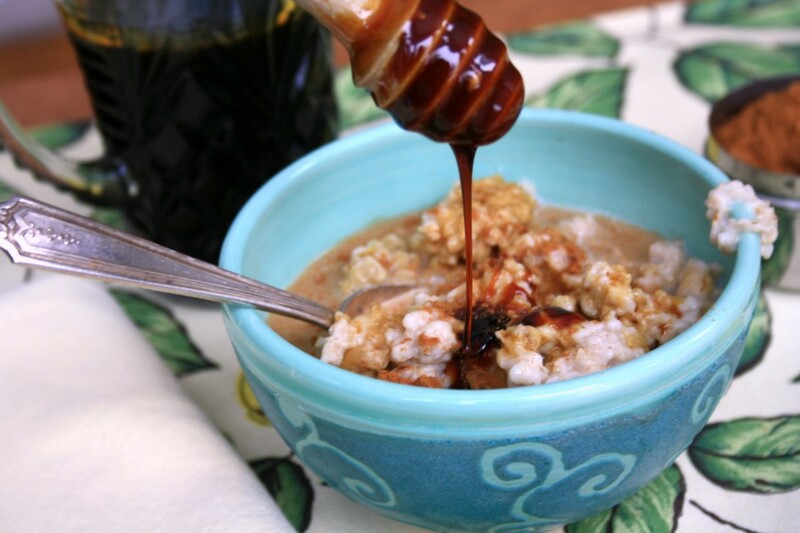 In a medium bowl whisk the oil, molasses and honey or maple syrup. Add eggs, one at a time. Mix in the pumpkin purée, milk and vanilla. Add the wet mixture to the dry mixture and stir just until combined. 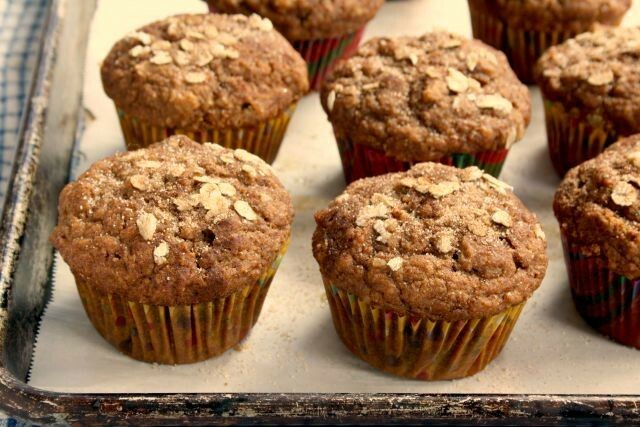 Spoon batter into muffin cups and sprinkle with a little cinnamon and oats. Bake at 325 F for about 25 minutes. Granola was a big recess treat when I was little. It wasn’t that easy to eat out of a little bag but it was tasty and filling. This was in the mid 1970s when granola wasn’t mainstream and granola bars had yet to be invented. I can’t recall what mom put in her granola, aside from rolled oats, but I do remember it was very sweet and buttery. 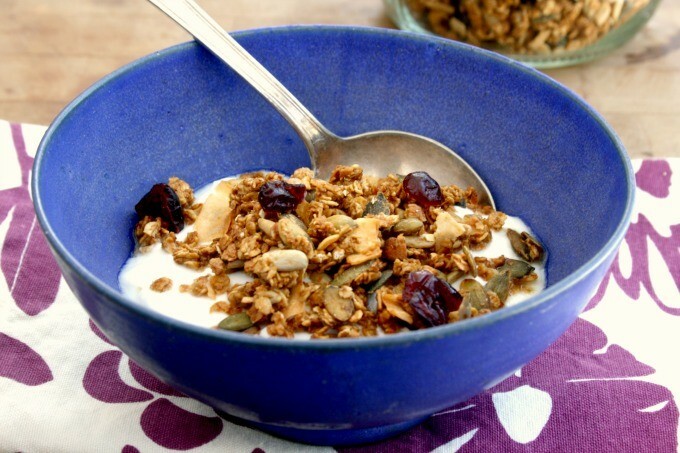 My family’s first granola recipe came from a neighbour who got it from a friend in California. That original recipe is long gone but this cookie recipe, given to me by a co-worker a decade ago, reminds me of it. They’re sweet and buttery and loaded with all sorts of good things. School-friendly option: Replace the nuts with additional sunflower and pumpkin seeds and additional dried fruit. In a large bowl mix the oats with the nuts, seeds and coconut. Melt the butter in a medium saucepan. Add the brown sugar, molasses, honey, hot water, vanilla and salt. Stir until the mixture is smooth and the sugar is dissolved. Remove from heat and pour half over the dry mixture. Stir well then add remaining sugar mixture. Mix until fully combined. Cool a bit before stirring in chocolate chips. If you let the batter cool for a bit it will be a little stiffer and easier to shape. Make sure you smooth the sides. Place on a parchment lined baking sheet and bake for 20-25 minutes. Cool completely before moving them – they need to set. 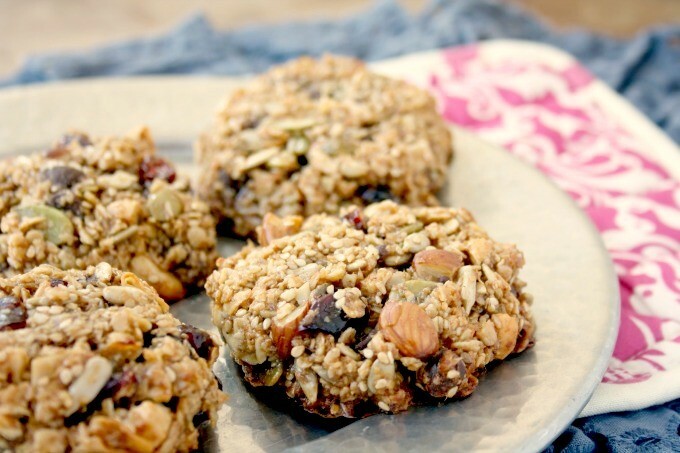 Hearty Granola Cookies Nutritional info: Per cookie. 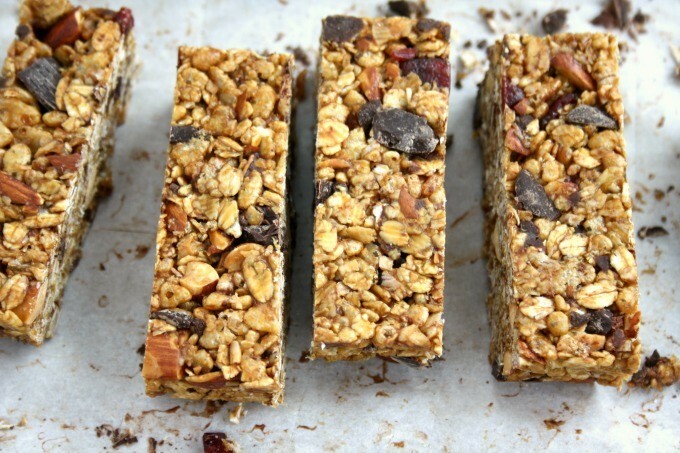 Want to make them traditional granola bar style? At step 2 throw all of the dry ingredients into the food processor and blend until everything is uniform. Scrape into a mixing bowl, add sugar/butter mixture and combine well. 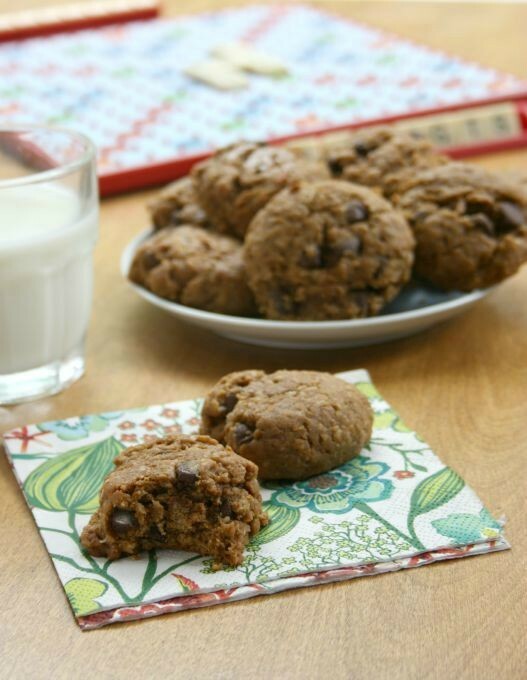 Stir in chocolate chips and press into a parchment-lined 9″x13″ metal pan. (Press as firmly as possible.) Bake at 350 F for about 35 min or until they’re golden around the edges. Cool completely before cutting. Why buy what you can so easily make at home? Some of the easiest things to make at home are those that we often buy. Take granola, for example. It’s really just a matter of tossing things together and then throwing them in a slow oven for three-quarters of an hour, stirring from time to time. 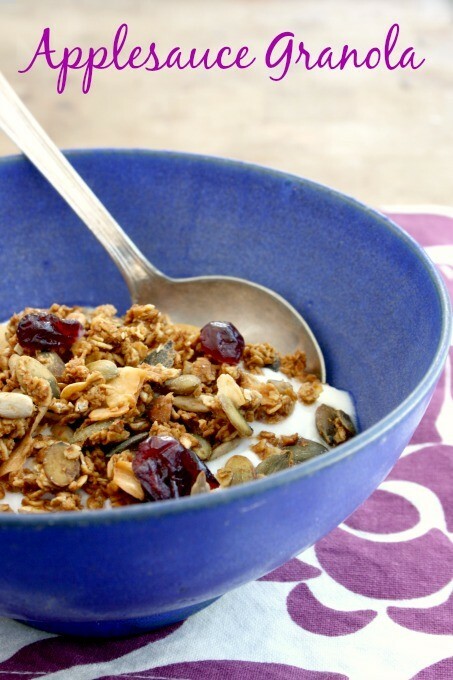 Make it once and you’ll never buy granola again. And then you’ll start making up your own recipe, substituting different nuts and seeds. You might even throw in some Smarties or chocolate chips at the end and call it trail mix so your kids will eat it. 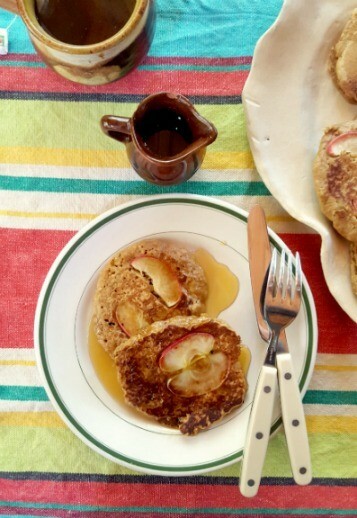 This recipe is adapted from Brown Eggs and Jam Jars, an excellent new cookbook from the author of Simple Bites blog. Preheat the oven to 300 F and line a large sided cookie sheet with parchment paper. 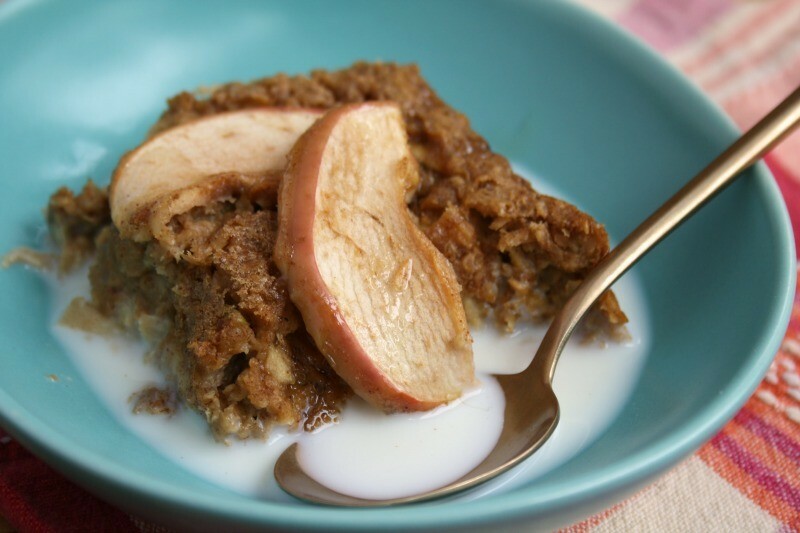 In a medium bowl whisk the applesauce with the molasses and oil. Stir the wet mixture into the dry, making sure to coat the rolled oats well. Spread evenly in prepared pan. Bake for 45 minutes, stirring every 15 minutes. If it still needs to dry out a bit leave it in the oven, turn the oven off and check it after five minutes, then 10 minutes. Remove from oven, stir in the dried cranberries. Cool completely before packing it in a container. 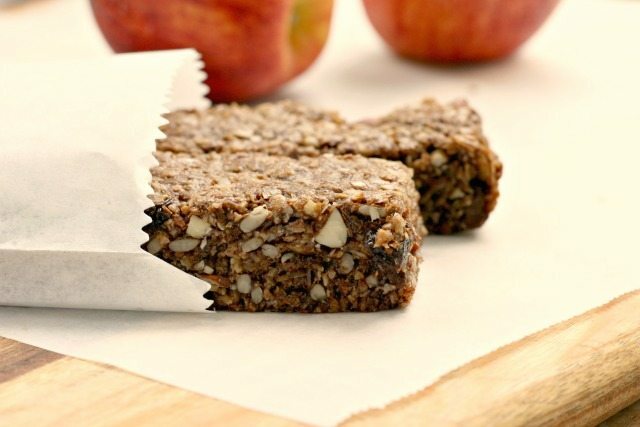 Packing healthy snacks for the ski hill, car trips or any old time isn’t always simple. Grabbing fruit is easy but finding a sweet treat that my kids will eat, is tasty, satisfying and full of healthy stuff isn’t always simple. To keep my kids full (or at least full enough to last until lunch or supper) I need something that will stick with them, takes time to digest. I also need something that feels a bit like a treat because homemade snacks have tough competition — My kids’ first choice is always a Reese’s Peanut Butter Cup. 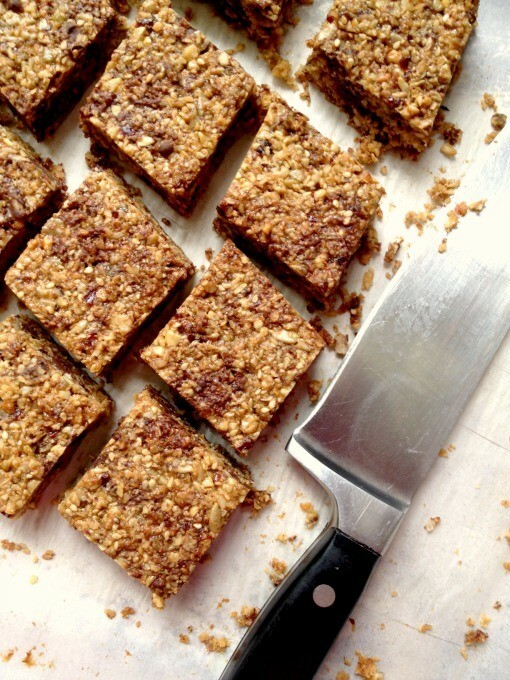 These Crispy Cranberry Almond Granola Bars fit the bill. They’re a sweet treat that’s a bit healthy. To make these school-friendly, or simply change them up, replace the almonds with a mixture of sunflower seeds and pumpkin seeds. To really amp up the nutrition use half blackstrap molasses. *To make these gluten free choose gluten-free rolled oats and crisp rice cereal. 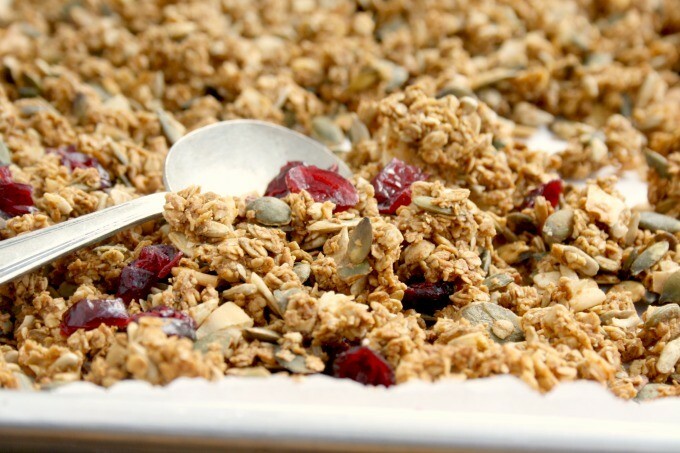 Combine the oats, rice cereal, cranberries and almonds in a large bowl. Melt butter, molasses and brown sugar in a saucepan over medium heat. Bring to a gentle boil and cook 2 minutes. Remove from heat and stir in vanilla extract (it will sputter). Pour hot syrup over the oat mixture and stir to combine. Allow to cool for a minute then stir in chopped chocolate. Press mixture firmly (and I mean firmly) into prepared pan and ensure it gets right to the edges. Try laying a sheet of parchment paper overtop to make it easier to press down. 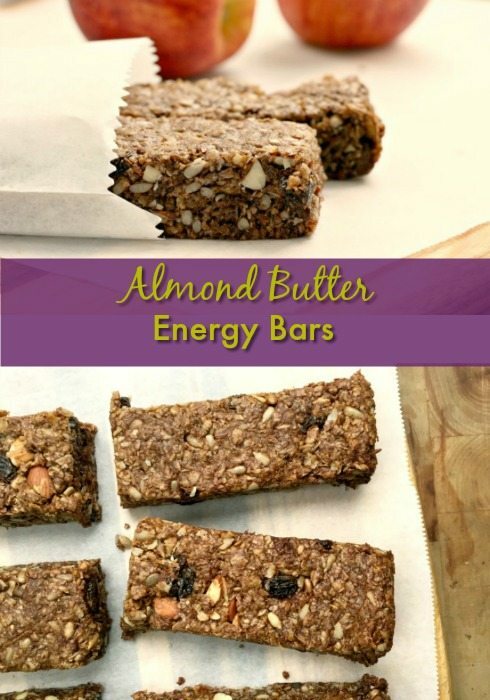 Refrigerate until set and cut into bars. 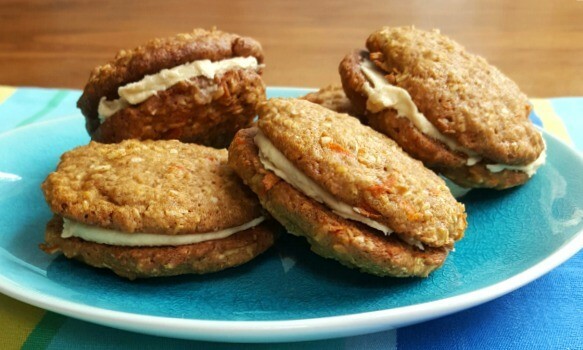 A good old fashioned oatmeal cookie is hard to find. 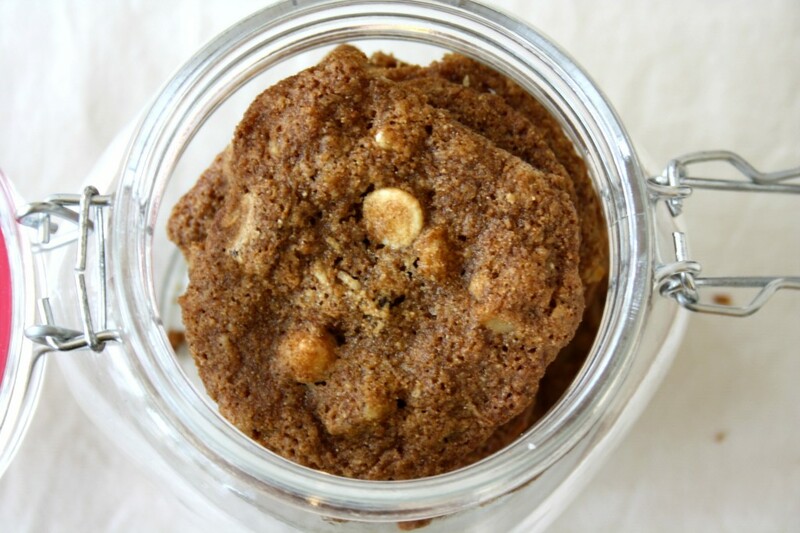 The kind of oatmeal cookie that’s thick and soft and can fill you up. 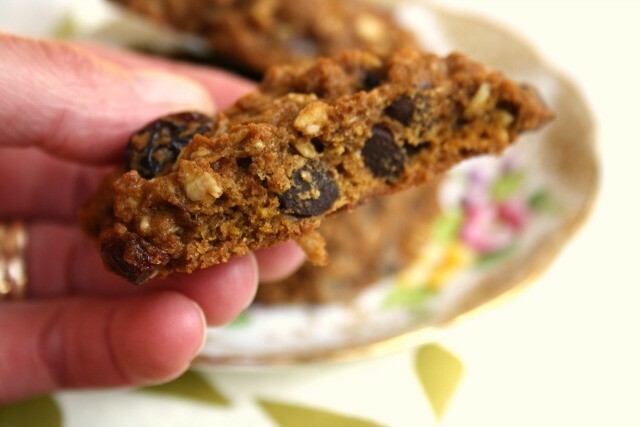 The kind of cookie that feels substantial and a little bit healthy. 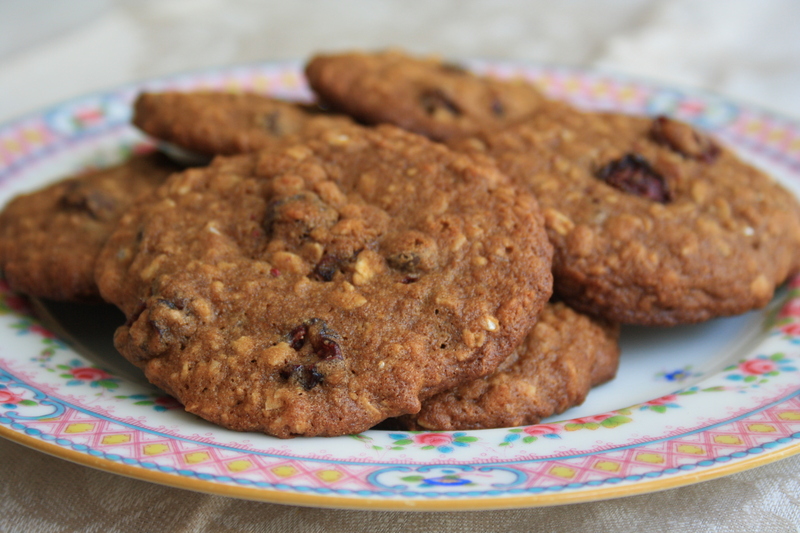 That’s why I used to choose them at the university cafeteria —oatmeal raisin cookies were always bigger than the chocolate chip cookies, a better value for my student budget. It had been ages since I’d had a cookie like that in fact I had forgotten all about them. I’m not sure I even had a recipe for them. 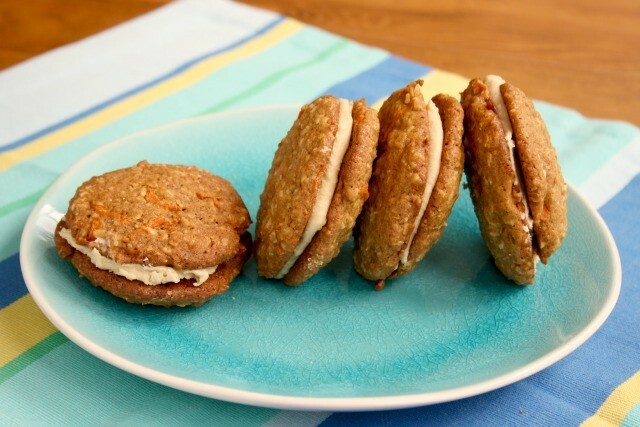 Then came along this recipe for Pumpkin Oatmeal Cookies and just the look of them took me back. The oatmeal raisin cookies that I recall eating didn’t have pumpkin in them but it makes a delicious addition. The pumpkin adds a great flavour dimension and as you can guess, pumpkin is a natural with the spice blend. In a large bowl, whisk flour, rolled oats, baking soda, spices, and salt. In a medium bowl whisk the melted butter with molasses, brown sugar, and white sugar. Whisk in the egg yolk then the pumpkin and vanilla. Mix until well combined. Drop dough by the spoonful (2-3 Tbsp.) onto a parchment-lined baking sheet and spread it a bit with the back of the spoon. Bake for about 15 minutes or until cookies feel set in the centre. This is a soft cookie. If you’d like them a bit firmer bake them longer. 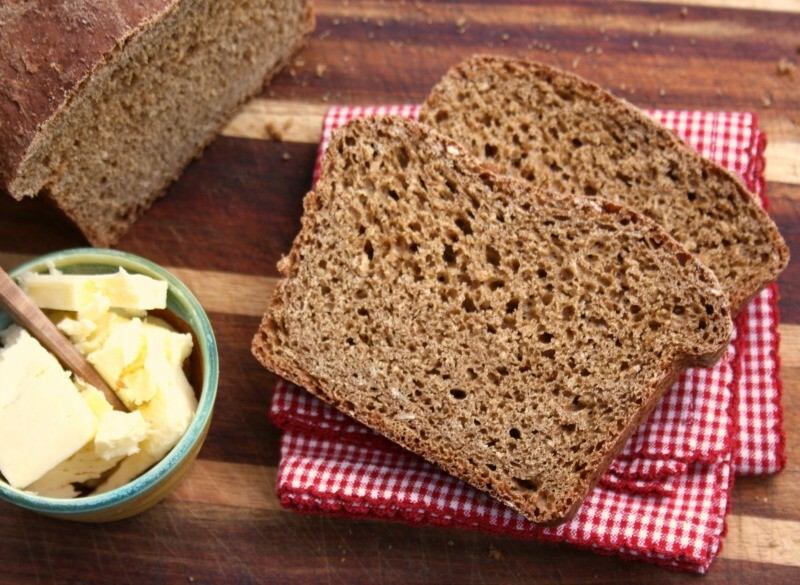 This easy molasses brown bread recipe is ready in three hours (including rising time). 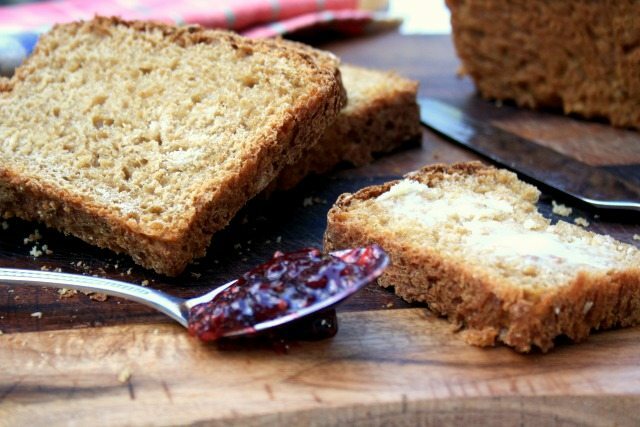 If you’re new to yeast bread, this is the best beginner recipe ever. I’m one of the bloggers participating in The Canadian Food Experience Project, a national program that’s helping to identify (or at least add clarity to) a Canadian food identity. This month’s task is to write about a regional Canadian food. If I was to put in front of you a plate of homemade cookies, a slice of homemade cake and a loaf of homemade bread that’s just warm enough to melt the butter, which would you choose? Is there anything better than homemade bread? Is there anything more satisfying? Growing up in Southern New Brunswick, and anchored by Irish and Acadian roots, homemade bread meant one thing to me: molasses brown bread. Sure there’s the classic Maritime Brown Bread that’s steamed but I grew up on the sweet and chewy oatmeal brown bread richly flavoured with molasses. We’d eat it on Saturday night with baked beans, as would half of Atlantic Canada I suspect. 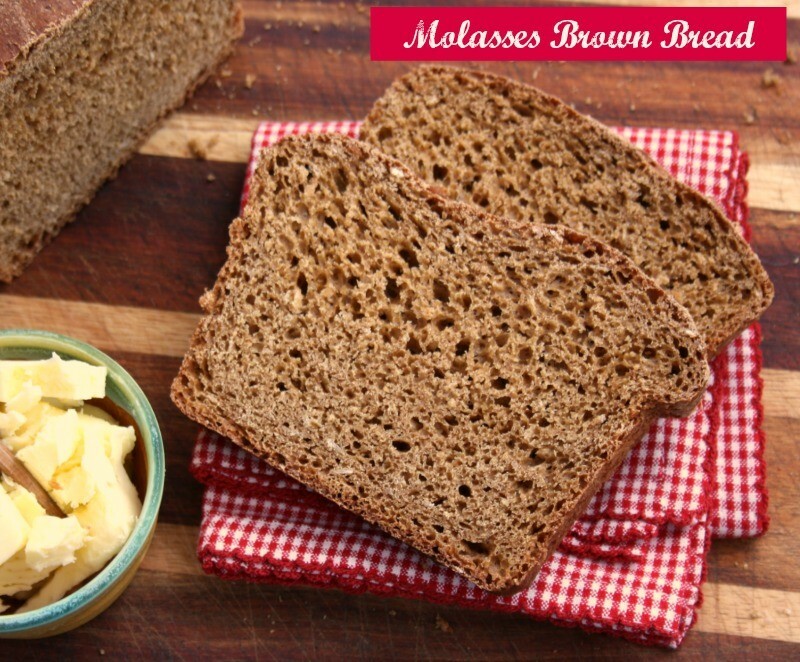 Molasses Brown Bread is still my all-time favourite bread – nothing can match it in flavour or texture. 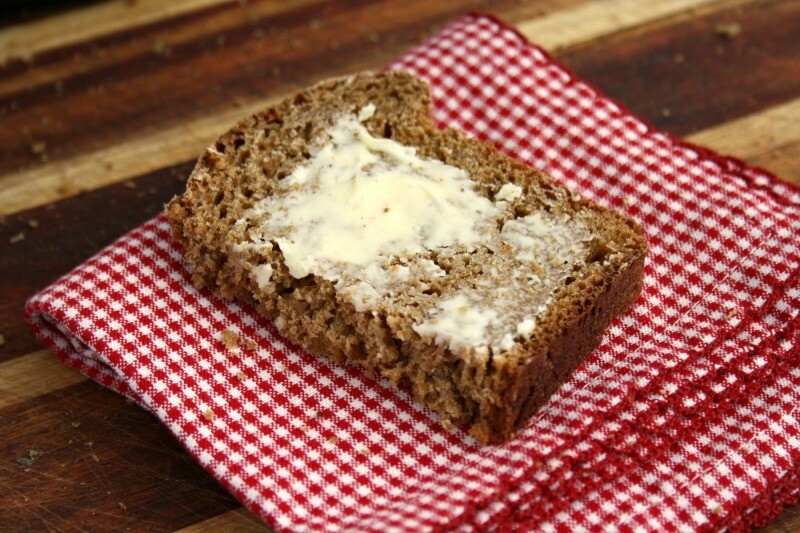 This molasses brown bread recipe is an easy yeast bread to make, takes just one rising, and is very forgiving (unlike the Irish). This recipe came to me from one of our Facebook fans, Sarah Ingalls. 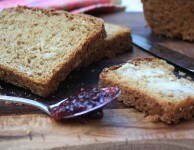 It’s similar to my mom’s brown bread recipe only it has more molasses so is a little moister. Sarah called it Three-Hour Brown Bread, which is a pretty accurate description since it’s a cinch to mix up, rises to double in about 1 1/2 hours then goes straight in the oven. I added whole wheat flour to the original recipe and used butter instead of the shortening originally called for. Enjoy this bread alongside a bowl of Roasted Red Pepper Lentil Soup or Molasses Baked Beans. It’s great as a mid-morning snack too, no butter necessary since it’s sweet and moist. In a small bowl dissolve sugar in the 1 cup of warm water and sprinkle over the yeast. Leave for 5-10 minutes. In a large bowl mix molasses, rolled oats, butter and salt. Add the 1 cup boiling water, whisk, and then add the 1 cup cold water. Add flour gradually and scrape dough onto a floured surface to knead in the final cup of flour. Cut dough in half and place in two large bread pans that have been well greased or lined with parchment paper. Cover each plan with a dishtowel and set in a warm place to rise until almost double in size (about 1 1/2 hours). When ready, remove from oven and let cool about five minutes before removing from pans to cool. What’s a distinctly Canadian food in your region? Do you have a favourite family recipe? 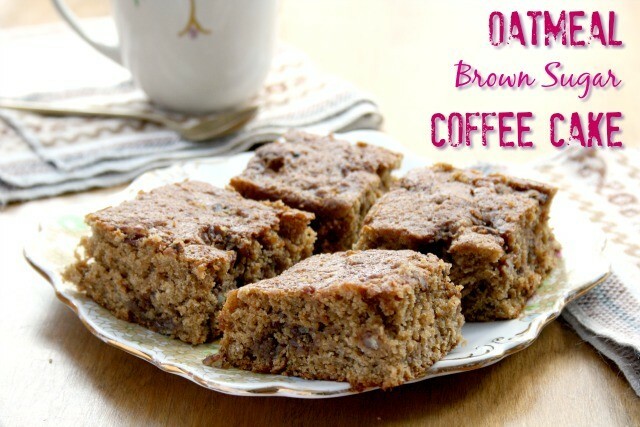 This easy oatmeal brown bread recipe is perfect for beginners. It requires very little kneading and you don’t need to proof the yeast. 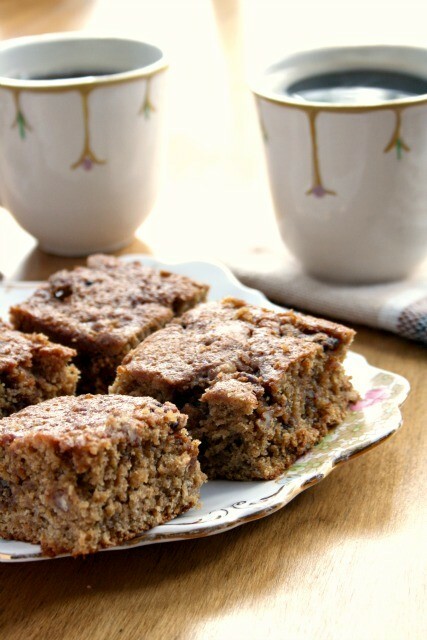 Oatmeal brown bread is cold weather comfort food. It’s just right alongside baked beans or a hearty stew, or toasted with butter and jam, or may be drizzled with molasses. Like many Maritimers I grew up eating fresh-baked brown bread with supper on Saturday night, smeared with butter and dipped in something warm. This recipe came from my aunt Nana back in the late 1960’s. 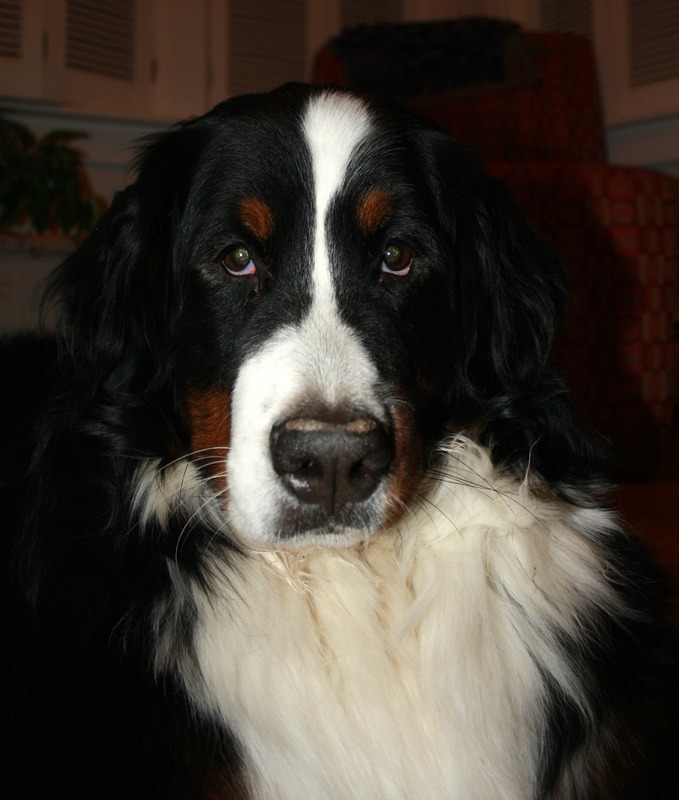 She was a transplanted New Brunswicker living outside of Montreal. The recipe was given to her by a next door neighbour who just happened to be from New Brunswick too. What are the chances? Two transplanted New Brunswickers living next door to one another in a suburb of Montreal, sharing recipes for comfort food from back home. I love this recipe. You don’t need to proof the yeast and there is no kneading involved so as far as breads go it’s quick and easy to mix up. I think it was the first yeast bread I ever made. I grew up eating this bread alongside molasses baked beans. Is homemade bread your comfort food? 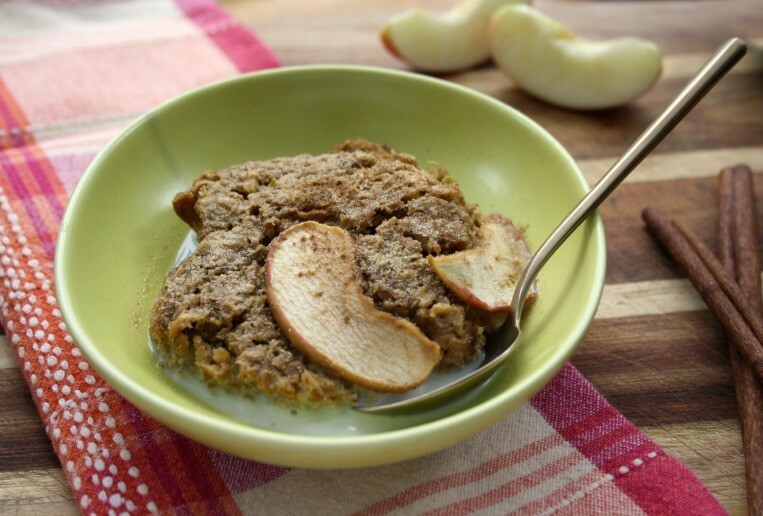 In a large bowl combine butter, salt and rolled oats. Pour the 2 cups of boiling water over the rolled oats mixture. Cool to lukewarm. In a small bowl combine the 1 cup warm water and sugar. Stir in yeast then add to the cooled oat mixture. There is no cookie I love better than oatmeal chocolate chip. They’re a little bit chewy, a little bit hearty and substantial. 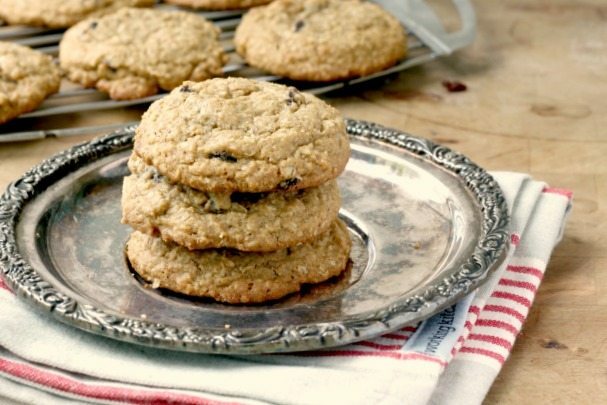 (I like to eat cookies in pairs but I’ll admit that when it comes to oatmeal chocolate chip, I’m usually satisfied after just one. 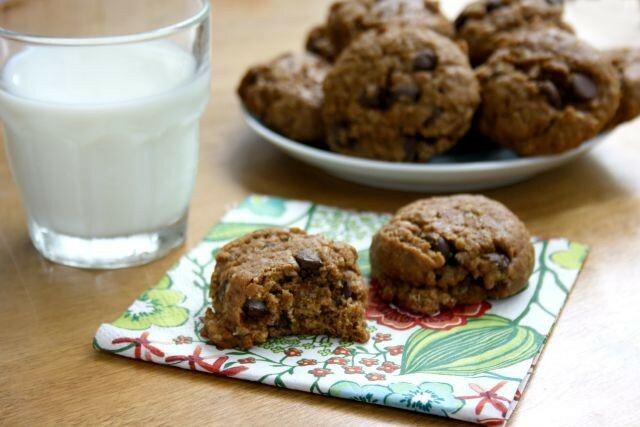 Imagine my delight when I came across this recipe for oatmeal molasses chocolate chip cookies. Molasses and chocolate is one of the most beautiful pairings in the world. 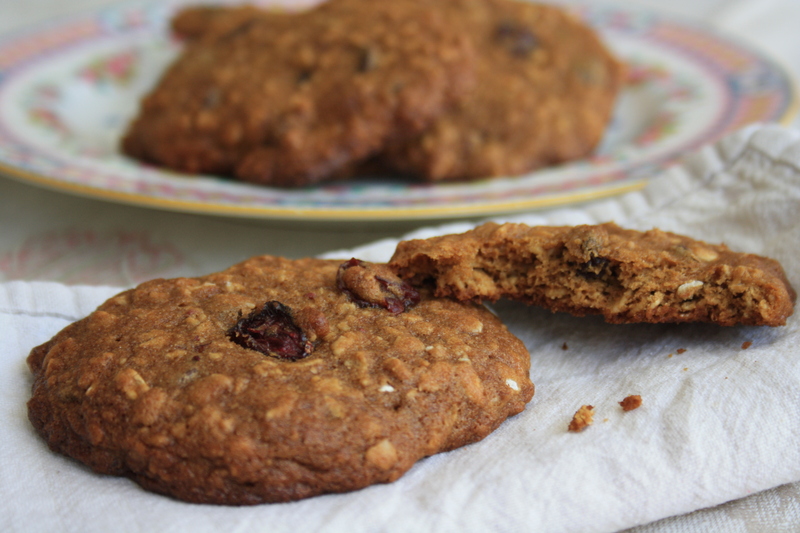 Add a few dried cranberries and you have a lunchbox cookie with delicious substance. 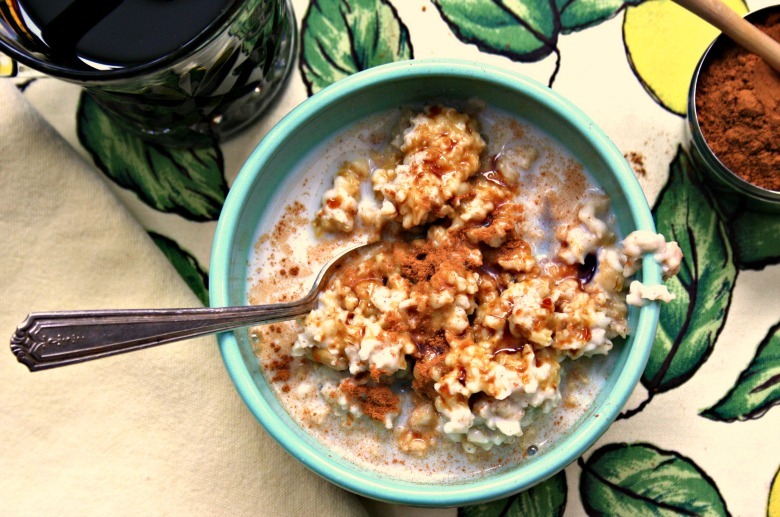 Use old-fashioned rolled oats for the greatest texture. In a large bowl, cream butter and add sugar gradually. Blend in the eggs and molasses. In another bowl, sift together flour, baking soda, salt & nutmeg. Combine dry ingredients with the creamed mixture. Mix in cranberries and/or chocolate chips. 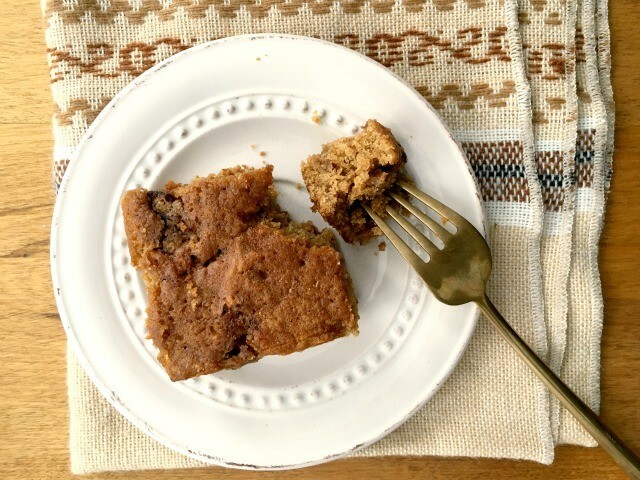 Drop by teaspoonful on a parchment lined baking sheet. Bake at 375 F for about 10 minutes.